New Labor party chairman Avi Gabbay asks outgoing leader to continue as opposition leader because he is currently not an MK. Former Minister Avi Gabbay officially entered his post as chairman of the Labor Party on Wednesday afternoon after defeating MK Amir Peretz in the Labor party primaries last Monday. 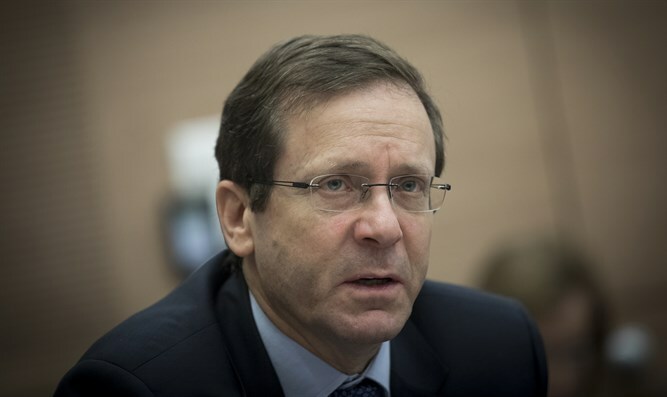 The outgoing party chairman, MK Yitzhak Herzog, accepted Gabbay's request and will continue to serve as opposition leader due to the fact that Gabbay does not hold a seat in the Knesset. "I will help as much as you want," Herzog told Gabbay at a press conference Wednesday. "I call on all my friends and colleagues from the Labor party and the Zionist Union to close ranks." "I thank you, Avi Gabbay, for your appeal to me to continue to serve as leader of the opposition in the Israeli Knesset. We sat and spoke about this last night, in light of the unusual situation. I agree to your request. Gabbay noted the polls published last night which showed a large increase in support for the Labor party following his victory in the primary. Of course I was happy to see the polls last night," Gabbay said. "But more than all the polls, which are really flattering and wonderful, I am mainly encouraged by the reactions of the people I hear and speak with, from all parts [of Israeli society], who intend to return to the Labor Party."